This 1960's quintessential Australian beach house will take you back to childhood holidays and simpler times. 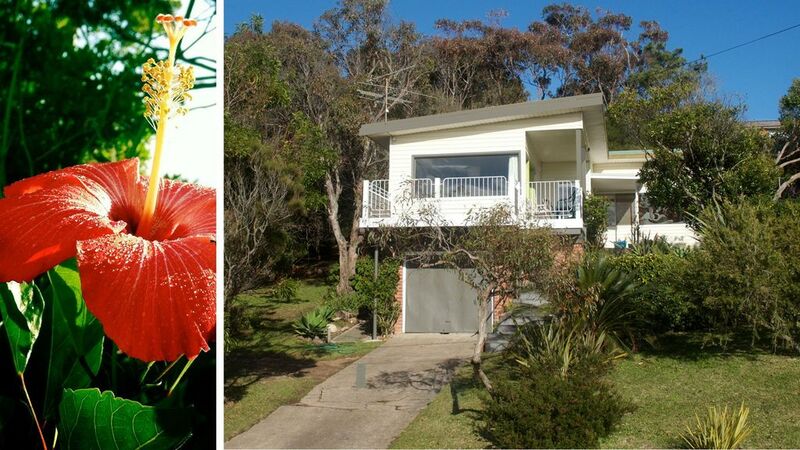 One of the original Pambula beach houses it offers prime location on the beach road, just three minutes walk from where the river meets the sea. Lovingly refurbished in mid-century style, the house has ocean views from the balcony and both picture windows (lounge room and sun room) The open fireplace will have you snugged up for lounge room whale watching (July to November), the balcony will have you lazing in the sun, wondering if you should amble to the beach or make a G & T. A great selection of cooking books are provided along with an extensive range of novels and DVD's (for both adults and children). The house, built by my family when Pambula Beach was a sleepy and secluded haven, still maintains a quiet and relaxed feel. The native garden and adjacent bush block is rich with bird life and is visited each dusk by grazing kangaroos. To access secluded Little Beach, stroll across the road and down through the nature reserve. A short walk across the rocks to the north takes you to a patrolled surf beach, and just around the corner to the south is the scenic river, a great spot for kids to swim and adults to fish. Please note: Linen not provided, please bring sheets, towels, bath mat and tea towels with you. If guests prefer to have linen supplied a linen service is available at an additional cost, please specify if you would like this service prior to confirming booking. The tariff covers the cost of a standard clean. If used the BBQ and fireplace should be left clean, all beds made, dishes washed, dried and put in cupboards. If more than a standard clean is required the extra cost will be deducted from the bond. Loved our stay at this beautiful house. The moment you walk in you feel at home. Very well equipped with all your needs. The view is magnificent. Close to surf and river. We had an awesome stay. We hired this super cool beach house for 5 nights & it was great! Absolutely spotless for a retro pad. The location was perfect, a short walk from one of the most beautiful beaches we’ve ever been to. This is one holiday accommodation we’ll never forget! Loved the attention to detail with the retro decoration and fittings.The open fireplace was cosy as was the house in general and the sound of the waves and views were delightful. Hope to revisit soon and stay longer next time. Perfect guests who left the house in a very clean condition. Easy and pleasant to communicate with, I would not hesitate to recommend them to future renters. We had a great time at Rutherglen. It was great to relax in the dining room and watch the seas roll by!! Our Kids enjoyed the exploring that they could do in the garden as well. We loved our stay in the retro chic of "Rutherglen". The location was perfect, the garden delightful and the house a perfect mix of old and new. Thanks to the owner for a great holiday property. We stayed here with our toddler and had a great time. The house itself is as represented, lots of retro charm and very homely - Just like nana's beach house! Location is great, an easy walk to two seperate beautiful beaches (one equiped with lifeguards). Would reccomended Pambula Beach as a holiday location and Rutherglen as homely retreat for a small family. Thanks!